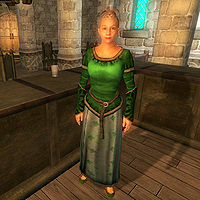 Jeranus is odd in the way that she is permanently essential, even though she has no quest ties and is pretty much a background character. The most probable reason for this is that she's related to the unfinished "Imperial Express" quest; at midday on the 12th of each month, as long as Erina Jeranus is still alive, Sergius Verus will head to the Black Horse Courier office in the Market District and spend a brief amount of time there. This page was last modified on 21 October 2018, at 23:00.